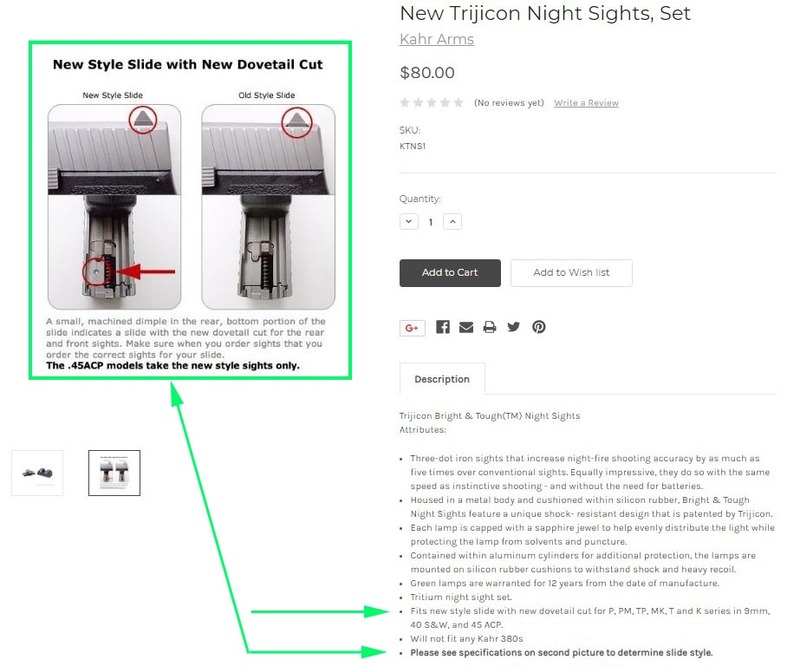 Thread: Will the new Trijicon Night Sights work on a 1996 Kahr K9? I am the proud new owner of a 1996 Kahr K9 pistol and I’m interested in replacing the older night sights (XS Big Dot) with something new, and I was considering the Trijicon Night Sights (3-dot) on the Kahr Arms website. Any idea if these sights will work on a 1996 slide/dovetail? Thanks for any help. I had the same issue with my older T9 -- and instead, I went with an awesome set of Dawson Precision Fiber Optic Sights (click link for more details) which you can see on the link, as I had posted that info in the Kahr Tech forum months ago. I found a set of old style night sights for my K40 at www.opticsplanet.com.